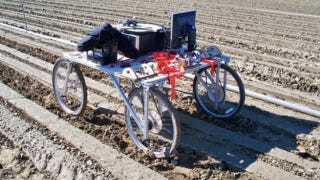 A prototype weed-seeking automaton could change the way seven billion humans eat, as well as help to end industrial agriculture's reliance on toxic herbicides and itinerant labor. The "Lettuce Bot" is a four-wheeled weeding machine designed and built by Indiana-based startup Blue River Technology, using a $400,000 angel investment as well as an early grant from the National Science Foundation. It relies on an integrated camera and advanced visual algorithm suite to differentiate between two breeds of lettuce and common field weeds, then aims and injects the invasive, nutrient-stealing little bastards with a toxic cocktail of plant fertilizer. The dosage scorches the weeds' roots with a chemical burn, killing the plant, and the extra fertilizer feeds the produce—it's a win-win. "Most of the technologies used in farming today have been of two types - mechanical, which permits bigger, more efficient tractors, bigger planters, and bigger harvesters; and genetics, which offers crop modification. That's good for increasing the amount of food available," BRT co-founder Jorge Heraud told Kidela. "However, large segments of the population don't like it. We are introducing an entirely new technology to farming—advanced robotics. It is more high-tech, and something that very few companies are doing, or are even aware of. We believe that agriculture is a perfect place for automation. There is too much labor being used in some segments of agriculture and we want to change that," he explained. The latest iteration of the Lettuce Bot will eventually be pulled behind a trailer through the fields at speeds up to 3 MPH (the current prototype does it at a third of that speed). It relies on a trio of visual algorithms. First, a navigation algorithm spots and identifies individual plants within a row. Next, the classify algorithm discerns lettuce from common weeds with ~98-percent accuracy (the system does this by comparing what it sees to a large library of pre-identified visual data on what iceberg, romaine, and dandelions look like.) Finally, it engages the kill algorithm, which allows the machine to accurately inject the lethal load of fertilizer into a weed's root system by estimating the needle's subsoil depth. But why lettuce? First, it's California's number one crop (yes, besides marijuana). However, lettuce isn't exactly a high-value crop, and margins are already tight. They're even tighter when you have to pay an army of laborers cash to clear the fields by hand, because you can't utilize cheaper inorganic pesticides, and because they can't use W-2s. What's more, bacterial outbreaks such as e. Coli, when they are traced back to organic foods, are commonly caused by cross-contamination from workers' boots. The Lettuce Bot could drastically increase farm productivity while simultaneously reducing an illegal, dangerous, and questionably-compensated industry. "Agriculture is a $500-billion industry and yet it hasn't adopted new technology," said Heraud in a press statement. "Most people don't know what kind of technology is needed for agriculture. I believe that there are technologies that can be used in agriculture that are not being employed." The prototype is, of course, still under development, and it has to work out plenty of kinks. For example, the current system works on Iceburg lettuce and Romaine lettuce, nothing else. If one wanted the machine to weed, say, an asparagus patch, they would first need to preload the robot with huge data stores of marked visual examples of asparagus, so it could know what to kill. Assembling such a data store is no easy feat. However, despite its current developmental hiccups, BRT hopes to deploy its first commercial lettuce-picking units by the middle of next year, before moving on to tomatoes, carrots, and strawberries. BRT is also currently testing alternatives to the existing fertilizer-kill methods. Those could include cutting out the weeds, like herbaceous boils, or depositing small, very hot food-quality vegetable oil on weedy seedlings.